For more information or to get involved, visit the CIF website here. Working at height poses some of the biggest safety risks in the industry, such as falls from height and being struck by a falling object. In fact, falls from height is the biggest cause of workplace fatalities and injuries in the construction sector. While working at height is often unavoidable, the following steps can be taken to reduce risk to your staff. Risk assessment must always be carried out on a work site and be regularly reassessed. 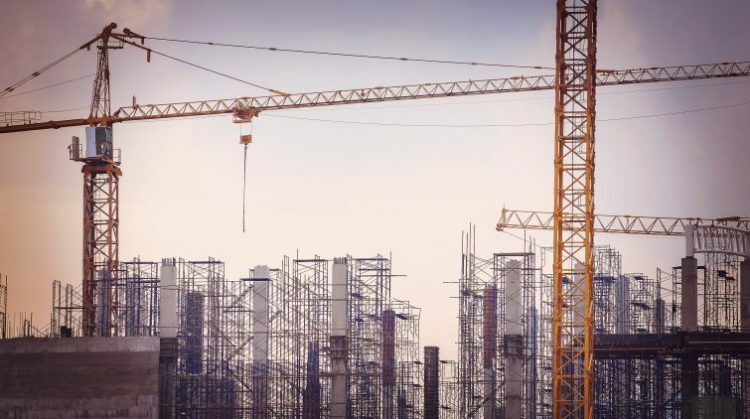 As part of this, you must ensure that the building or structure being worked on is safe, secure and in a good condition particularly if supporting weight. Weak structures or roofs with loose tiles should not be used to support a worker or ladder and extra care must be taken before and during work. All workers must be certified as skilled, knowledgeable, experienced and physically able before carrying out work at height. Training should be provided to anyone who is not experienced – this can be on the job training. Any equipment or loose materials should be secured to prevent anything from falling on the employee carrying out work or anyone else below. Any equipment not in use should be organised and stored in containers. Small tools that are regularly used can be secured to a work belt. Safety equipment and in particular helmets, should be provided for anyone working on the ground in order to avoid injury if an object does fall. Where possible, using ladders to work at height should be avoided. Instead consider secure, structured scaffolding platforms. Only use ladders for light work and for a maximum of 30 minutes at a time. It is important to implement and practice emergency evacuation and rescue procedures for everyone working on site. All employees must be aware of their role during an emergency situation in order to reduce the severity and outcome. For those working alone, ensure that your employee has a way of alerting you if they suffer an accident. This is particularly important in emergency situations such as falls, as receiving medical assistance could be crucial. Find out how Coombes Forestry use StaySafe to monitor the safety of employees working at height. Working near or with electricity poses a number of safety risks such as burns, shocks, electrocution, fires and explosions. However, steps can be taken to reduce risk. All electrical points at a work site should be identified before work begins. Be aware of hidden wires including overhead power lines and underground cables. Once identified, all employees entering the site should be made aware of electrical points and given a diagram if required. You may want to consider using warning signs where electricity is present. It may also be useful to obtain a map of services in the area so you are aware of how your work may effect other points. Visible checks must be carried out on electrical equipment, cables and power points to spot early signs of damage. Equipment must be tested regularly by a trained individual and any faults fixed immediately. All checks should be carried out as part of a set schedule and recorded. If you or your colleagues work with electric as part of your jobs, you must be fully trained and assessed beforehand. For basic electrical work, apprenticeships are ideal but additional training and experience is required for more specialised electrical work. If working in areas where there is a chance a worker could come into contact with electricity, or there are a large number of people on site, power should be switched off where it is possible to do so. Everyone on site must be aware that the power is to remain off and instructions on turning power back on should be given by a designated individual. If someone comes into contact with electricity they may be unable to remove themselves. The human body is a conductor of electricity so it is important that you do not touch them. Instead, turn off the power immediately and if you are unable to do so, use a non-conducting object such as a wooden pole to remove them from the electrical source. As with working at height, accidents associated with electricity could be fatal. Therefore, it is crucial that you have an emergency procedure in place and that everyone on site knows how to react should something go wrong. When thinking about workplace safety, we tend to focus more on physical risks. However, mental wellbeing can have a massive impact on health, productivity and personal safety. In fact, suicide amongst construction workers is not a rarity and it is estimated that 1039 construction/production workers committed suicide in Ireland between 2008-2012 (Pieta House). The following tips focus on how you can support employees and colleagues dealing with mental health issues. With an average of 8.7 hours being spent a day working in the construction sector, the work environment and relationships with colleagues, become an important part of our lives and mental health. Therefore, creating a friendly, supportive and open culture will not only have a positive impact on mental health, but will also encourage individuals to be able to discuss mental health issues if they have no one else to talk to. As part of an open work culture, if you believe an employee or colleague is suffering from depression, discussing it with them could save their lives. Of course it is important for the individual not to feel pressured and the issue should be tackled sensitively. If a colleague does open up about feeling suicidal, provide them with helpline numbers and offer to call yourself. Encourage your employees to report incidents of workplace bullying whether they are being bullied themselves or have seen a colleague being bullied. It may be helpful to set up a system where incidents can be reported anonymously. Work can be one of the biggest contributing factors to stress which can lead to illness and further emotional and mental effects. Aside from falls, mobile plant and equipment is the most common reason for fatal or serious accidents in the construction industry – yet most accidents are avoidable if the correct safety procedures are followed. Anyone operating moving vehicles and equipment should be trained on how to do so properly and safely. Training should include safely starting, operating and turning off machinery as well as how to implement safe stop procedures where appropriate. You must also ensure that all drivers are medically fit to drive and are able to take breaks to avoid fatigue. All vehicles and equipment must be inspected on a regular basis and any repairs carried out before they are used. Plant, equipment and in particular, vehicles, should be kept away from pedestrians and safe pedestrian routes around a work site should be made clear. You must ensure all drivers and operators have clear visibility and a signaller should be provided in a safe position to direct vehicle movement and any pedestrian movements. Operators should be provided with protective clothing where appropriate and anyone working near moving vehicles and equipment should be provided with high vis clothing. Everyone on site must be made aware of evacuation and emergency procedures so that they know how to react should an accident happen. Risk assessments will help you identify when and where an accident could happen but some things to consider include; overturning, collisions, falls, disruption of hazardous materials and contact with machinery. Reducing stress in the workplace sounds like a good start to a safe work environment. Thanks for the tips! Very useful and descriptive article. This could be helpful for creating awareness among the workers and employers about the risks in construction site and to take some measures to avoid them. Thanks for sharing this blog! Implementing emergency procedures helps reduce unwanted liabilities from popping up. Thanks again for the tips. This is some really good information about safety on a construction site. I like that you talked abut making sure everyone is well trained. It does seem like a good idea to have some extra safety features around the site as well. I am personally scared of heights and if I was working on a construction site that was high up I would want a safety net in place. Good article. There is so much to stay aware of to keep safe when working in construction. Another massive problem for construction workers is back pain. Learning how to work safely by warming up, keeping your core strong and body flexible, following safe lifting tips and good manual handling techniques, and not overexerting yourself will all help to keep you healthy too. Above tips very impairment to all Construction guys. I wish I had seen these tips when I started in construction. Thanks so much for sharing. I was very interested in how much of an issue mental health can be on a construction site, especially the possibility of being overworked! I work in an office setting, which is very different from a construction setting, but we also have issues with mental health and being overworked too. If I was a boss in any workplace setting, I would be sure to stress how mental health is a key aspect of safety in the workplace. I never would’ve considered the possibility of being mentally “overworked” when you are on a construction site. My son told me that he wants to work for a construction site when he grows up. I will be sure to tell him to avoid working too hard if he gets the job! You’ve got some great tips for staying safe at work. Construction sites are probably pretty dangerous, but the ideas you have here could help a lot. It makes sense that training needs to be done before any jobs are done at height. Heights can be scary!